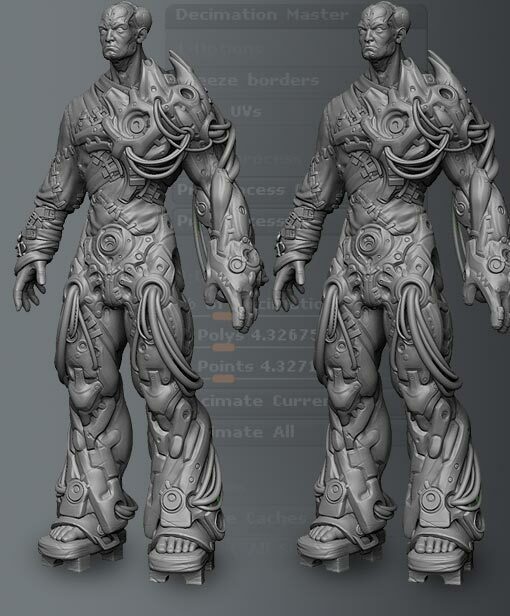 Decimation Master is a free Plugin for ZBrush that allows you to greatly reduce the poly count of a model while preserving the high resolution detail. Decimation Master's ease of use is matched only by its speed. You can interactively choose up to what percentage you optimize different areas of your mesh giving you a high level of control over how you preserve details while lowering your poly count. If your model contains many different parts (Subtools) then you can choose to batch decimate all of the parts together, or each one separately. Never before have artists been able to lower poly counts to such a highly optimized level while seeing almost no loss in detail. "The Decimation Master plug-in for ZBrush not only helped speed up production time, its results were of a consistently higher final output quality. The ability to mask areas and preserve resolution after decimation is nothing short of incredible!" "I've really enjoyed working with the Pixologic team during the development of Decimation Master. The results are very clean, and the plug-in makes the process of getting models from ZBrush back into 3ds Max as painless as possible. I love the ability to process all SubTools at once, and then dump them all out into a single .obj file. Decimation Master is now an integral part of our pipeline because it saves a lot of time, and allows us to process an insane amount of detail at a fraction of the original poly count." 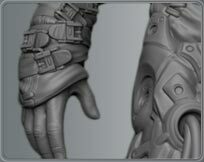 "I have been decimating everything today and taking it all into Mental Ray for renders, What a time saver!!! The masking rocks as well! I will most likely be using it this week for some 3D prints. I have only scratched the surface but this is going to be one of my favorites!!!" "If ZBrush is a rock factory, Decimation Master is the catapult: 2.000.000 points down to 100.000 without noticeable difference… You really have to press the wireframe button to believe it!" It was definitively the missing plug-in in our previous production pipeline for Tom Clancy’s Ghost Recon Advance Warfighter; using Decimation Master now greatly improves quality and efficiency for our next games."